In 2006 Iron Maiden went on tour with a show that was completely different from any other of their career, a performance of A Matter Of Life And Death in its glorious entirety. When the classic era Iron Maiden line-up reunited in 1999, plus Janick Gers, many seemed to think that 1980s nostalgia would be Maiden’s focus for the rest of their career. And indeed, the summers of 1999 and 2003 both brought tours that dug into the past for rarely heard gems that Maiden had not been able to perform with previous singer Blaze Bayley. 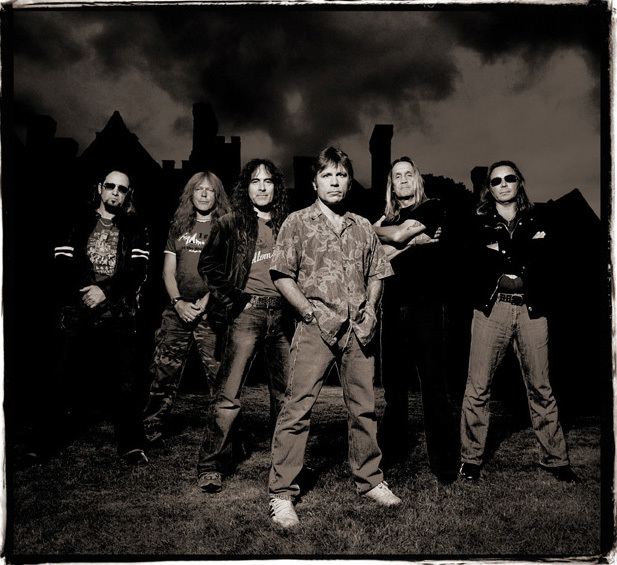 This culminated in 2005 with the first of Maiden’s trilogy of 1980s History tours. Taking the DVD release The Early Days as their starting point, the band played a set consisting exclusively of material from their first four studio albums in 1980-83. But, there was much more to the reunited Iron Maiden. They released new albums in 2000 and 2003, Brave New World and Dance Of Death, and the third record followed after the Early Days tour – 2006’s A Matter Of Life And Death. 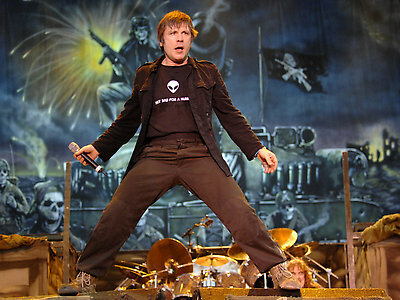 The final Iron Maiden line-up, 1999 to present, has continued to release new albums regularly. 2006’s A Matter Of Life And Death enjoys a lot of love from Maiden fans around the world. In late 2006 Maiden toured North America, Japan and Europe. They reacted dynamically to their recent History outing by playing the new album in its entirety. That’s right! The first 75 minutes of the show was A Matter Of Life And Death performed from beginning to end. How about that? This effort proved Maiden’s dedication to being much more than a nostalgia band. The Early Days tour had, controversially for some but completely logically, left Fear Of The Dark out of the set, for what would be the first and last time. The 2006 tour would leave out staples like The Trooper, and even The Number Of The Beast, the latter also for the first and last time. Another great recording from the tour is this audio-only radio broadcast from Stockholm, Sweden. Check it out! Bruce Dickinson fronts Maiden on their 2006 A Matter Of Life And Death tour, with an uncompromising focus on the band’s new album. 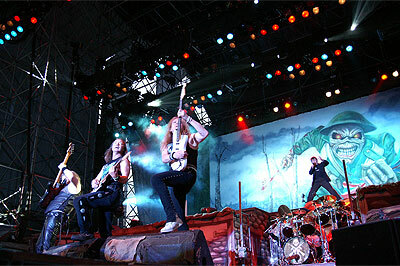 For many fans the 2005-2008 period would come to be seen as the pinnacle of Maiden’s double-edged creativity. At the center is a new album, which some already consider a classic, being performed in its entirety. At each end is a History tour that digs deep into the catalog – first the Early Days salvo, and then the humongous Somewhere Back In Time tour that pretty much recreated the Powerslave show. Click here for a FROM THE VAULT moment from 1982! And here for a FROM THE VAULT moment from 1983! I was there! I went as part of the Bruce Air Flight from Sweden to Milan (I flew from Greece to Sweden and back again, a total of 6 airports in a weekend!). Bruce flew the plane gave an excellent show and after the seconf show he flew the plane to Sweden and he went on straight to England (I don’t know if he piloted that one though!). We had pictures taken with him before the show and he signed them as well afterwards (soon after that hw quit having single pictures taken I believe. He was courteous but formal with us). At the show Bruce had a go at a #%$% who threw a bottle of water at him and damaged his microphone. Some guy tried to grab and steal my camera during the show and another kept punching my ribs to take my place at the barrier. But Italians are a great crowd, lively (unlike the English, I mean, Donington was awfuly quiet and so was Twickenham and O2 and Sonisphere. But Maiden are always on fire at home). Both nights were great, unforgettable experiences. Hail to my Bloodbrother Marco from Milan! Sounds like an incredible memory! Saw it in Dublin at The Point theatre, it was a freezing day in December. The most I remember was most people didnt have a clue what the set list would be because the plan wasn’t advertised before tickets went on sale. I’d say there was a polite applause after each new song, I doubt many had bought the new record yet. When FOTD was finally played, the whole place erupted (in relief?). We were hoping they would play more classics at the end but no such luck. Well any Irish fans ? Earls Court, London, for me. The power cut out half-way through. I remember thinking any other band would leave the stage while it got sorted. Not Maiden. They stayed on the stage, got some footballs and had an onstage kickabout. There was juggling. Bruce found a loudhailer and led a show tune singalong. That is the spirit that built this band through touring and explains why, once you’ve seen them once, you’re a fan for life. I was there and that is one of the best Maiden shows I have ever seen (and I have seen them 26 times!). The way they dealt with the power cut out is what makes them the amazing band they are. It is not just the music; there is that special bond with the audience too. On a related note, I bumped into Bruce in central London the day of the show while I was sightseeing with my partner (and I got the picture to prove it! 😆 ). To say that was a bizarre experience would be a massive understatement. Cool! Don’t suppose you saw the Brixton Clive-Aid gig as well (with Children of the Damned)? I think that was the best of my 15 Maiden gigs. Unfortunately I could not make it to any of the Clive Aid gigs. 😦 I saw them in Bilbao in 2007 on that tour though. Amazing. I wish they had the gall to do something like this again these days… I’ll be forever dissapointed that I never made it to Chicago to see them on this tour! “A Matter of Life and Death” is one of my top favorite Maiden projects. I would have LOVED to have seen this! Adam H, if they make a strong enough album like this, I hope so, too. In fact, at this point, I would personally much rather hear new music than see a new tour of an old concept. I’d love to see a return to the serious, thoughtful and thematic side of Maiden that we got to see on AMOLAD. DoD always felt a little cheesy and lacking (plus horrible production…) and TFF feels like a collection of half-baked ideas. I think they NEED another album in the vien of AMLOAD to end their career on a high note. I believe they have a lot more life in them yet, but I absolutely agree 100% with your observations. A Matter Of Life And Death is my favorite post-reunion album, easily. But I think it’s a very good idea to do a short tour next summer. Seems they will go pretty much straight from touring into doing a new album, which is what Adrian has wanted them to do for years. That’s a good build-up and primer for the studio work. I agree! It’s exciting that their doing something a little different than the normal routine, I can’t wait to see what sort of material will come of this! Would love to see them play ANY sort of theme in my area. Birmingham Alabama gets passed over for Atlanta without fail….EVERY AMERICAN TOUR. Last Maiden tour I got to attend was the Powerslave tour. That’s right….February…..1985!!!! How long does it take to go from Birmingham to Atlanta? 2 hours. But that’s not the point. I’ve got one HELLUVA speech about how overlooked Birmingham is when it comes to major tours. Back in the 80s….early 90s…..there were 2 big shows per month. Atlanta’s far enough away that it’s out of the question to go to a show during the week. I have a job that I really need to keep. Also….A Matter Of Life And Death is one of my favorite Maiden albums. I loved the “no mastering” job they did on it. Sounds great to me. Like I have said previously at some occations AMOLAD is my favorite post-reunion album of Maiden, but it isn’t flawless. Some of you say that the mixing of album is great, but I disagree. For me mixing has always been a bit low. What I mean by this is that album lacks some punch. You really have to turn the volume knob to MAX to really be able to hear everything. For me mixing of DoD and BNW has always been better than AMOLAD, but AMOLAD prevails musically. TFF mixing is even worse than AMOLAD though =). @HmB: Your issue with AMOLAD is probably not the mixing, but the fact that the album was not mastered. That’s why you have to turn it up really loud to hear everything properly. This is Steve Harris’ choice, not Kevin Shirley’s. Btw, I think The Final Frontier is Shirley’s best mixing job for Maiden so far, even if it’s my least favorite of the post-2000 albums. When it comes to playing a classic album in its entirety, I don’t think that’s ever going to happen. Gangland and Invaders are never going to be considered for a setlist, for example. (Personally, I’m really happy about that…) And Maiden have to date never dug out songs that were not performed on the original album tour. When this concept didn’t happen for the celebration of Seventh Son these past couple of years, an album everyone in the band seems to like through and through, I don’t think it’s ever gonna happen for any album. The fact that you have to turn your volume knob up to make the music loud on AMOLAD is precisely WHY it sounds so good. Loud does not equal Good. When songs are mixed and mastered very very loud, you lose all the natural dynamic range of the instruments (the distance between the softest and loudest sounds). There is no way to ever get this back, unless the album is remixed and remastered. DoD is the WORST offender by far, because it was mastered from such a squashed, compressed CD copy. You can even hear the ACOUSTIC GUITARS distorting (clipping) on Journeyman! Yeah, you don’t have to sell me on that. I make albums, I’ve been through it many times over. It’s like Shirley himself said when Steve refused to master AMOLAD, “you guys just have to use your volume controls then.” That being said, a good mastering job can work wonders for an album, like the new Pink Floyd remasters. @Adam: Yeah, I know what you mean. It’s a shame too, because some of Shirley’s mixing on DoD is awesome. It just gets completely lost in a bad mastering. I actually never thought much about the ’98 remasters when they came out, but earlier this year I got my original edition CDs out of the basement. And wow. Now I get it. Same here. I’ve been slowly amassing a collection of original pressing CDs… but Iron Maiden, Seventh Son and FOTD are proving quite difficult to find. Powerslave is the only original CD that I do not own yet (I have the LP and the enhanced CD though). Where do you guys usually look for used original CDs? There’s a chain here in the states called “Disc Replay” that buys and sells used CDs, DVDs, Blu Rays, video games, systems, and electronics (they used to sell vinyl, but no longer unfortunately). Usually I can find some sweet bargains, like those I mentioned above. I think their policies are sometimes a bit sketchy though… charging $25 and $35 for copies of First Ten Years #3/#7 respectively. “That’s less what our competitors are charging”, the clerk says, after clearly just looking them up on Ebay…. I’ve been so bummed ever since this disappeared. Does anybody have a copy? Found it elsewhere? I keep clinging to a bit of hope for some kind of anniversary release in 2016. I can’t fathom that this band, of all bands, didn’t film one of these for posterity.